Peel, wash and cut the bitter guard into thin slices add 1tbsp salt, vinegar and 1 tsp turmeric powder, mix it well and keep aside for 15 minutes. Now wash and boil with jaggery and turmeric powder for 10 minutes. Squeeze the excess water and keep aside. Heat oil in a pan add methi dana as they crackle add sliced onion and fry until golden. Add red chili powder, salt and boiled bitter guard mix and cook on slow heat for 5 minutes. 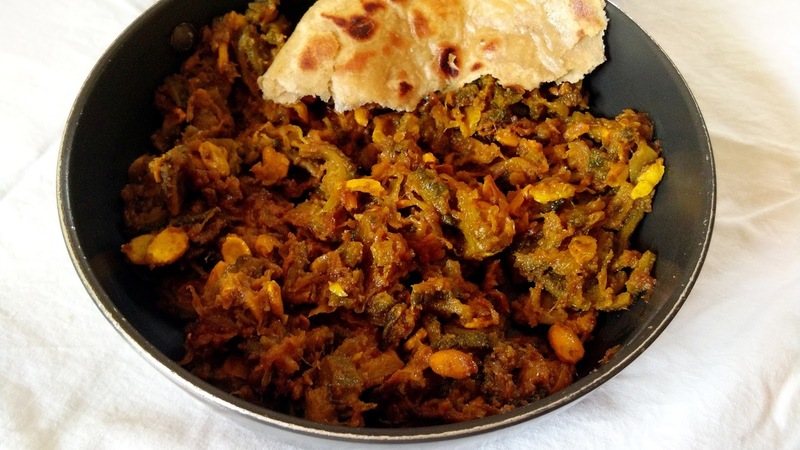 Add dry mango powder, karela masala mix it well fry until karela becomes crispy and brown in color. Switch off the gas.Serve with paratha, chapati or Dal Rice. Use roasted fennel and methi dana powder instead of karela masala.